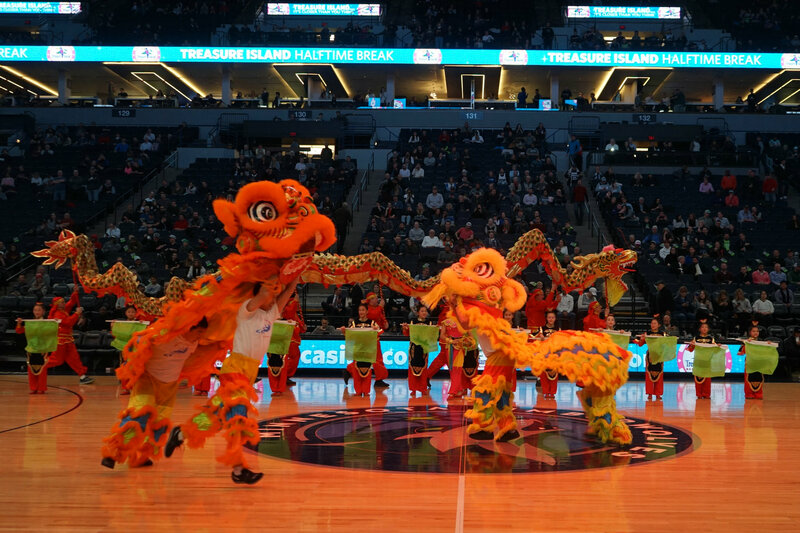 On the evening of February 11th, the Minnesota Timberwolves held their 2019 "Happy Chinese New Year" home game at the Target Center in Minneapolis. 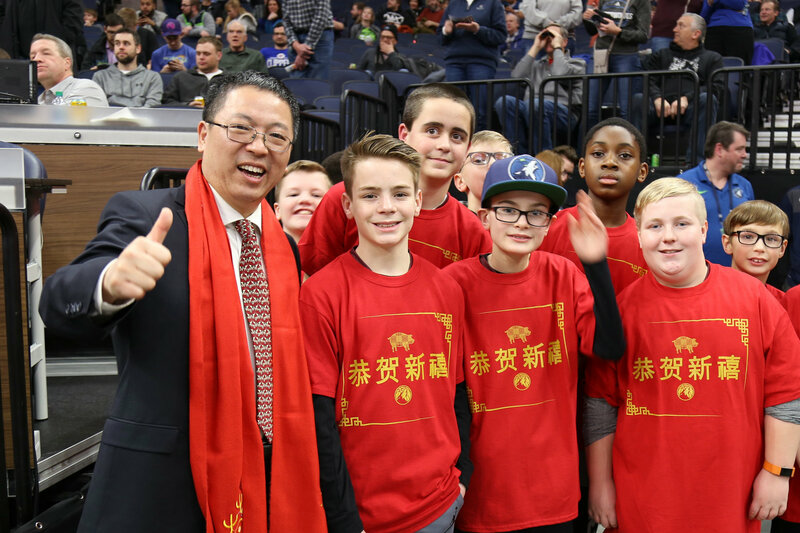 Deputy Consul General Huang Liming, Consul Zhang Min of the Culture Affairs Division, President Ethan Casson and Chief Strategy Officer Ted Johnson of the Timberwolves, Director Joan Brzezinski of University of Minnesota’s China Center, and over 10,000 fans attended the game. 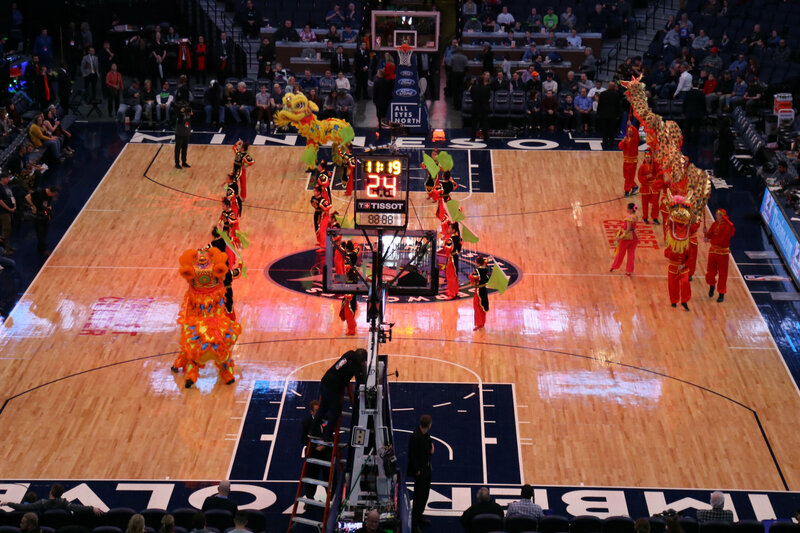 This was the Timberwolves’ second ever "Happy Chinese New Year" game in celebration of the Chinese New Year. That night, the Timberwolves played against the Los Angeles Clippers. 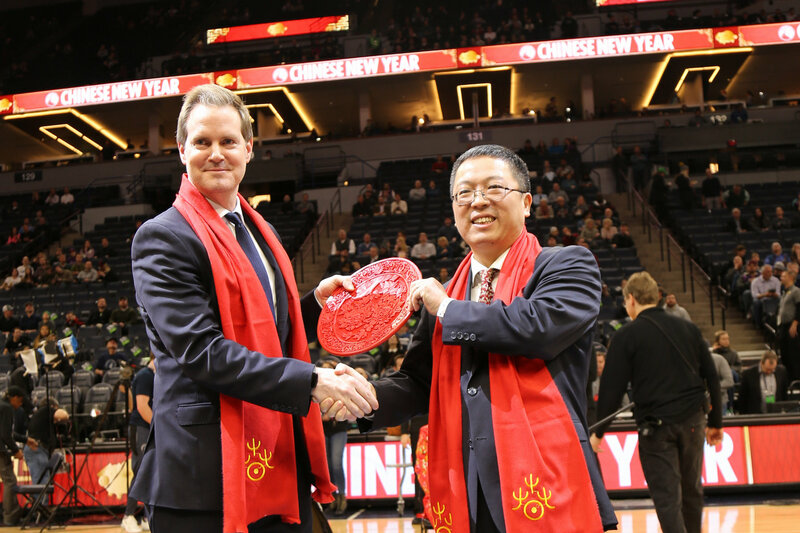 After the announcer stated the significance of the night’s celebratory New Year game, President Casson and Deputy Consul General Huang Liming walked side by side to court center, gave each other a special New Year gift, and waved to the crowd in honor of the holiday celebrations. 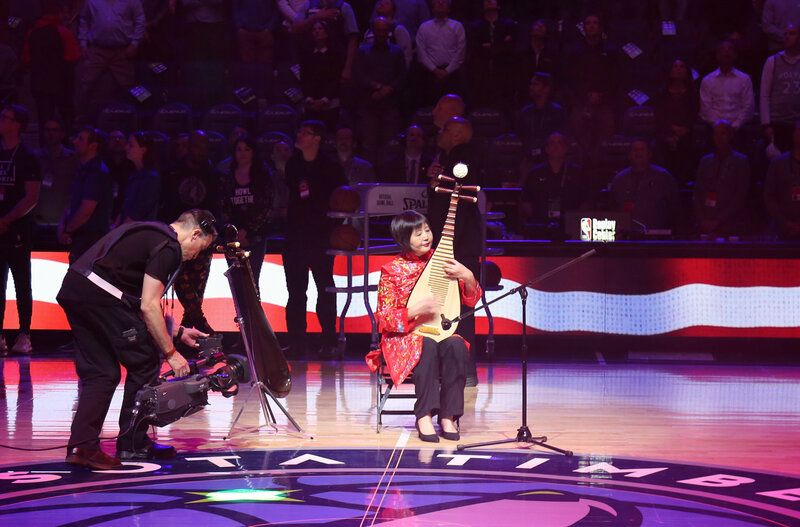 Well-known Chinese musician, Gao Hong, then performed a special rendition of the American national anthem on the pipa, a unique, 4-stringed traditional Chinese instrument. The messages “Chinese New Year" and “Chinese New Year Celebration” flashed brilliantly on the court’s center screen and the wrap-around screen of the stadium. 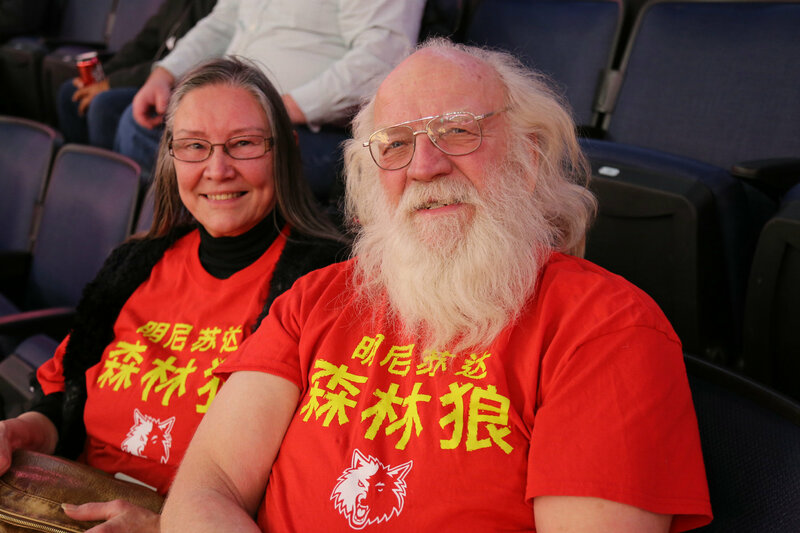 Many fans were spotted in red t-shirts imprinted with the Chinese characters for "Happy New Year" and "Minnesota Timberwolves". The Timberwolves’ cheerleaders even wore red, traditional Tang dynasty clothing during their dance segments. The stadium, filled with these significant symbols of Chinese culture, abounded in the festive holiday spirit of the New Year. During intermission, the Minnesota Huaxing Arts Group and Chinese Dance School performed a "Lion and Dragon Dance"—while two golden dragons spiraled to and fro in flame-like frenzy round a pair of peppy baby lions, about a dozen colorfully-clad Chinese and American children, with bright neon flags in hand, stepped out impressive martial arts and dance moves. The crowd, flying out of their seats at the performance’s end, clapped their hands dry and cheered their throats hoarse. 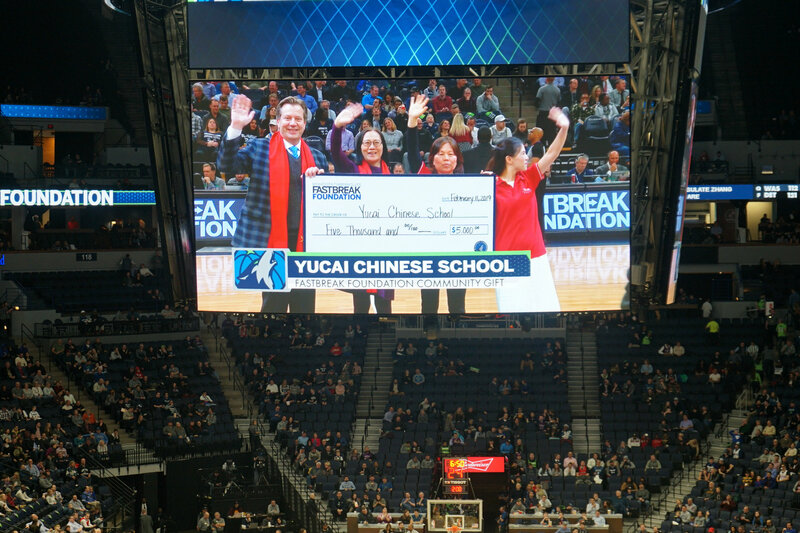 At the end of the third quarter, Chief Strategy Officer Johnson walked out to the center of the court to announce the award of “Best Cultural Contribution to the Community” to the Minnesota Yucai Chinese School. 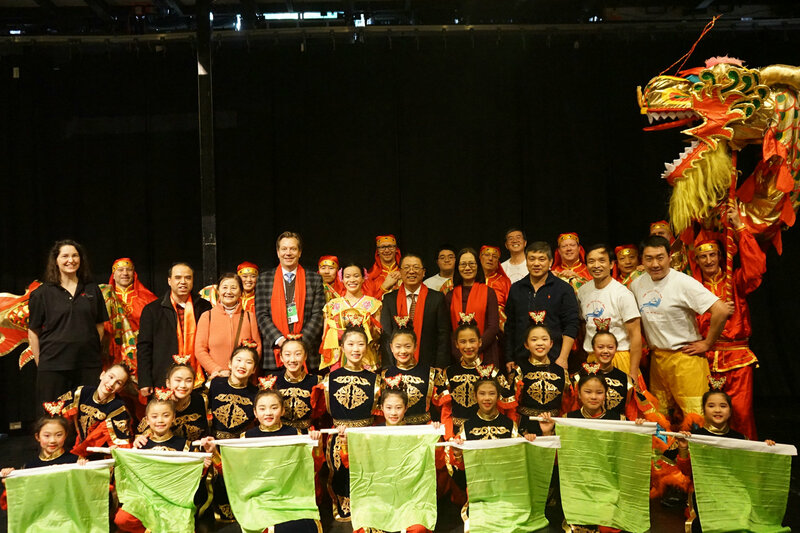 Together with Consul Zhang Min, he presented the school’s principal, Wang Yingzhi, with a $5,000 check from the Timberwolves Foundation in recognition of the contributions Yucai Chinese School has made to the building of community culture and promotion of China-US cultural exchanges. On the afternoon of game day, Deputy Consul General Huang Liming met with Chief Strategy Officer Johnson, giving him a brief introduction of China's economic and social development in recent years and the exchanges and cooperation between China and Minnesota’s friendly provinces and states. He exclaimed that the Consulate General is committed to working with individuals and organizations from all over the Midwest, including the Timberwolves, in order to further develop friendships and promote cooperation. Johnson recalled his experience last year leading the Timberwolves to compete in China. He hopes to strengthen cultural exchanges with China and is looking forward to maintaining a close working relationship with the Consulate General.